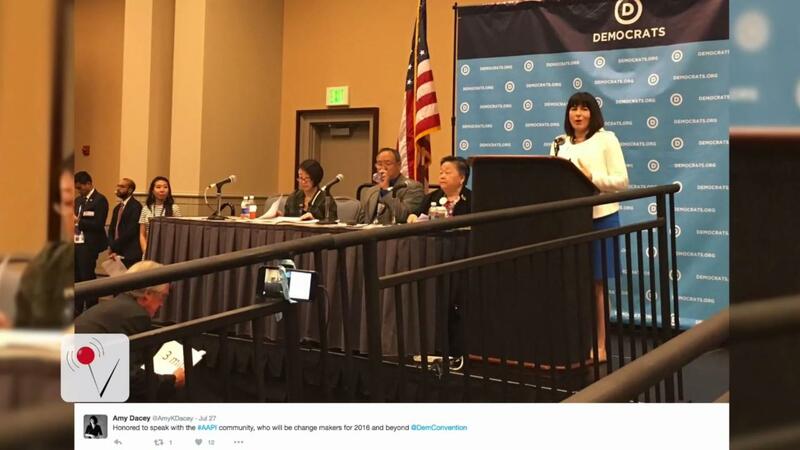 Democratic National Committee CEO Amy Dacey resigned Tuesday, about two weeks after leaked emails showed organization staffers considering floating arguments against Sen. Bernie Sanders of Vermont during a public feud with the DNC in May. The resignation comes amid a shakeup at the DNC that already forced Chair Debbie Wasserman Schultz to resign last week at the conclusion of the Democratic National Convention in Philadelphia. Following her resignation, a top figure at the DNC told Business Insider that the organization was simply trying to focus on getting through the convention before evaluating the committee's future further. But major meetings were held last Friday immediately following the conclusion of the convention. A career operative who worked on campaigns and Democratic-aligned organization for much of her career, Dacey oversaw day-to-day operations at the DNC since 2013, when she joined to help put the organization's budget woes to rest. Throughout the 2016 race, she maintained contact with state parties, often serving as a key liaison in disagreements among the different high-profile campaigns and actors. Sources speaking to Business Insider on background earlier this year feared that the dispute between Sanders' campaign and the DNC would overshadow Dacey's accomplishments reducing campaign debt.